As you might remember from yesterday's post, the icon in PDPworks 4.0 indicates a report is hyperlinked and can be clicked to view, print, or download. Watch your in-box for previews of new features, requirements, and report upgrades. If you are not receiving our email announcements, why not subscribe? We are pleased to introduce several new twists in one of PDPs most familiar reports. Formerly known as the Personal Development Report, PDP has re-named this comprehensive report with the more descriptive title, Personal Dynamics Report. Today, we are pleased to highlight a few new enhancements we know you will like. 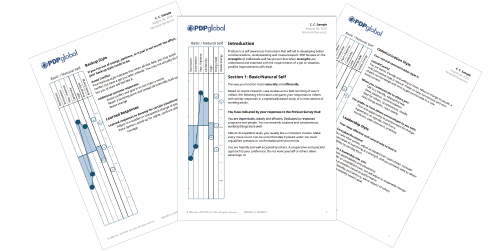 When we certify individuals to conduct Feedbacks, we have long recommended that PDP Professionals begin with the Data Sheet and Intensity Chart. However, those two pages appear at the very back of the Personal Development Report. In the new Personal Dynamics Report, you will find that these two pages of graphics have been brought forward to just after the cover page. At the beginning of Section 1, you will be pleased to know that we have expanded of our "summary paragraphs" by 35%. These paragraphs are the ones that begin the narrative portion of the report and describe, or summarize, the overall trait distribution. Bottom-line, the additional diversity of these paragraphs provides even more "spot-on" description of an individual's Basic/Natural Self. We moved the Operational Styles (e.g., Communication, Leadership, and Back-up styles) up from Section 4 into Basic/Natural Self-Section 1 of the report. Because these Operational Styles are derived from the Basic/Natural Self, it only made sense to move them from so far back in the report to just after Energy Level. We also added "Learned Responses," which is new to PDP's reporting. Learned Responses describe the types of responses individuals of different high traits could apply in order to increase their overall success. The moving of the Operational Styles to Section 1 also means that when you are doing a feedback your discussion will move seamlessly from Basic/Natural Self to the Priority Environment and Predictor/Outward Self and then directly to the Motivators and Overriding Needs. This flow should allow you to create an easier connection between motivators and Priority Environment. Another enhancement worth highlighting is the simpler pagination scheme for the Personal Dynamics Report. The title page will be counted as page 1 of the report with the rest of the pages following in order. For those of you who do feedbacks online using Adobe Acrobat Reader, there will no longer be any question regarding the page number to which you are referring! Join the thousands of happy customers and gain access to the amazing power of PDP.